We have visited two wineries, one more or less by chance (it was on the way to the ancient ruins, honest) and the second with a group from Tom's school, in a—wisely—chartered bus. Both are in the Bekaa Valley, which gets 240 days of sunshine a year and has been the scene of wine growing for hundreds and hundreds of years. Ksara Winery is the oldest and largest in Lebanon, with grapes planted in the early 18th century and real caves that cover two kilometers/over a mile. The Jesuits took over in 1857 and ran the place until 1972. It is a heavily visited place, well organized and with a bit of a Disneyland atmosphere. Handfuls of small children race about, playing on the furniture (e.g. tables made of wine barrels). On entering, people are grouped by language, an unenviable task on busy days, performed by the trilingual tour guide. If several groups arrive at once, English might be sent off for wine tasting while Arabic watches the video, hastily set to Arabic, and French gets a tour of the caves. Groups then switch and tour guide keeps track of it all. The video is very professionally done and covers the history of the place and how the wine is produced. The caves, which date from Roman times (! ), were expanded during World War I, and are the perfect temperature for aging wine. The second winery we visited was Massaya, a newer and smaller winery known more for its arak (the strong stuff, like raki or ouzo). A busload of American Community School staff made its way over the mountains to the place, well off the main road. We knew that in addition to wine sampling, a huge feast awaited us. The setting was lovely—shaded tables and benches with comfortable cushions adjacent to the rows of vines, and even a pond with koi-- rustic elegance. There was a slight breeze and it was fabulously quiet, at least away from the eating area. Living in the city as we do, this was a real blessing. As you enter, you pass a woman in simple clothing sitting close to the ground baking flat breads with thyme, or cheese or meat—the appetizers. Trays of tomatoes, olives and the tastiest tiny cucumbers ever complemented the warm breads. The wine began to flow. In time, the feast began. Buffet style, there must have been 30 dishes. Not the standard “mezze” fare we have seen in several other restaurants but much more elaborate--gourmet farm. Apparently this takes place every Sunday. Another chapter in the heavenly elixir department is rose water. I had seen the bottles of rose water sold in import mar kets in the States and wondered what it was used for. I thought it was a man-made creation—like we buy synthetic vanilla extract, which tastes more strongly of vanilla than the real thing (and is, of course, a whole lot cheaper). Well, guess what. The rose water/syrup that comes in bottles is actually the real thing. Roses smell different here. They look exactly the same (to us, anyway) but they have this candy sweet smell that is, well, good enough to eat. There are several brands of syrup in the grocery store—I buy the one without the red food coloring. I mix 5 parts water to one part rose syrup, and serve over ice. We have taken to keeping a pitcher of it in the fridge. A small shop that I pass by on my way to Arabic class has a cart that sticks out into the sidewalk so far that one must practically detour into the street. That part is not so unusual. But what amazes me is that the cart is laden with packaged drinks—small bottles of juice and cans of beer—and snacks that the store sells. Stacked on the cart outside on the sidewalk, day after day, and nothing is taken. There is a broad range of Moslem lady fashion in Beirut. It runs from total Western—not only no headscarf but skin tight t-shirts—to black headscarf and robe. The latter is very uncommon and I suspect these ladies are visitors from another country. What is more usual are various intermediate stages. Today I saw a 20-something lady with bell bottoms and spangled cowboy boots, modest dark flowing headscarf and baggy, long sleeve shirt above. There are many brightly colored headscarves, worn with long skirts or with tight, flared jeans and high heels. If you wear a head scarf you will also have a long-sleeve top, which could be long (mid-thigh or even coat-like, mid-calf) and baggy, or short and skin-tight. If the latter, as in fashion in general here, sparkles and frills are big. One wonders how one finds one’s niche. We noticed that the very sweet couple who run the coffee stand nearby have an adult daughter who does not wear a head covering, though Mom does. Well to do Beirutis who left the city heat for summer homes up in the hills have returned, making streets and shops busier at night. Tom had to wait for the hot from the convection oven bread he likes, in a line behind a flock of Filipino maids and other customers who had placed orders in advance. As we get ready to go to bed we happen to glance up and see three, count ‘em three, big fat mosquitoes on the ceiling. This is the last week of October—enough already! A battle ensues. The ceiling is 9 feet up. Tom’s preferred weapon of choice is the towel. I prefer The Economist. About 10 minutes later Tom has gotten two of them and we give up. It is late. Unfortunately the third one is quite successful in avenging her departed family members--by morning we have been ravaged. Fortunately the weather is starting to get cooler, so hopefully this is the last of these guys. We had two amazing trips. The first was a day trip to Byblos, up the coast from Beirut about 45 minutes’ drive. We got to go with new friends Tim and Francoise in their rented car, along with their sweet little dog Tupi (so nice to get a dog fix; he sat on Tom’s lap the whole way back). 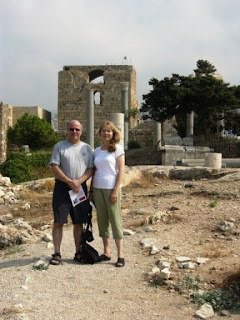 Byblos has a quaint harbor guarded by a Crusader castle, and a nice pebble beach. Byblos claims to be the planet’s oldest continually inhabited city. It is home to an excavated area of mind-boggling ancient ruins. We paid all of $4 to enter the sprawling historic site, and view the remains of an incredible mishmash of centuries and civilizations, from Stone Age to Byzantine, Phoenician to Roman. The Crusader Castle was built by the Franks in the 12th Century, mostly with blocks pillaged from the earlier Roman ruins. There are six different layers of city walls, dating from the 3rd century BC. And it is all so picturesque, overlooking the Mediterranean Sea. The next day we ventured over the mountains to the cities of Zahle and Baalbek. 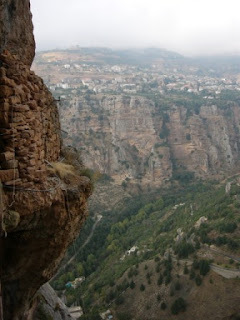 Tom calls the trip over the mountains an “E ticket ride”… Zahle is a beautiful town along a river in the Bekaa Valley. It is reminiscent of Italy or France, its old stone buildings decorated with colorful wooden shutters, ornate iron grillwork, chandeliers and flowering plants. It is predominantly a Greek Catholic town, and bells rang out the Sunday morning as we walked around town. It took less than two hours to get there by public minibus (they leave when they are full) over the mountains. We stayed in a budget hotel at Zahle, accurately listed by Lonely Planet as “dilapidated but character-filled” old house = Ottoman era. After checking in to the hotel, we boarded another minibus for Baalbek, 30 minutes to the north. Outside of town Tom spotted an Israeli tank that had been captured during the Israeli invasion last year. It had been mounted on a pedestal about 20 feet high, right next to the main road, a prize for all to see. In contrast to the Christian town of Zahle, Baalbek sports posters of Hezbollah leaders and even Iran’s Ayatollah Khomeini. Outside the historic site at Baalbek we were offered picture postcards of the ruins and bright yellow Hezbollah T-shirts for sale. As you drive into the center of town the historic site comes into view at once. You can’t miss it—there is a vast area of ruins over which the enormous columns of the Roman Temple of Jupiter loom. Jupiter is the larger of the two main temples on the grounds. It’s six remaining standing pillars, made of beautiful red and grey flecked granite, jut 70 feet into the air. They are over 7 feet in circumference—the largest in the world! The stones used for the base of the temple are mammoth blocks weighing close to 10 tons--the largest stone blocks ever made. See photo of Tom (below) standing in front of a block and a downed pillar. Apparently people used to think the place was built by giants. The smaller temple, the Temple of Bacchus (photo at right), is larger than the Pantheon in Athens, and is better preserved. It’s just amazing. It was completed in 150 AD and has survived major earthquakes, religion changes from pagan to Christianity and Islam, and a spell as a dungeon in medieval times. An outer portico supports a ceiling of decorated curved stone with scenes of Mars’ winged victory, Diana taking an arrow out of her quiver, Vulcan with a hammer, etc. It gave us a much better idea of what temple remains we have seen in Italy and Turkey looked like originally. Scattered around the temple and the sprawling site are chunks of carved stone with lions, eagles, faces, etc. and bits of fallen columns and pedestals. There are no barricades or guardrails to keep you from climbing around and touching the relics. It is quite a fantastic site. Back in Zahle we enjoyed a walk by the river with many other visitors celebrating the holiday. There was an arcade with video games, air hockey and bumper cars. There was popcorn, cotton candy, and the local equivalent of peanut brittle. Strolling families, as everywhere some women with headscarves and some without. We treated ourselves to nice meal at a riverside restaurant (see photo showing dessert)—pleasantly surprised when the bill came to $20. Back over the mountain, I shot a photo of a bridge destroyed by an Isaraeli airstrike last summer. There is a detour. Climbing into the minibus, Tom's watch fell off, but he didn't notice. Someone picked it up and handed it to him. Later, a family getting on passed their toddler in ahead of them. A man held the child on his lap and talked to him until the family got settled, then the child was passed from arm to arm back to them. Lovely people! The school arranged a trip for staff last Saturday to the Cedars of Lebanon. Featured prominently on the Lebanese flag, the cedar tree is very important historically in the region. Huge forests once covered the mountains here, and provided the Phoenicians and those who followed them with high quality wood for boat making and for export. The cedars of Lebanon are mentioned in the Old Testament; the Temple of Solomon in Jerusalem was built of their wood. Today, most of the remaining cedars--some 1,000 years old--are in two forest preserves. The trees have a distinctive shape and though they are not tall by Pacific Northwest standards, they are distinctive and majestic. We followed a winding road along and above a deep, 30 mile long gorge (Qadisha Valley--in photo) which is itself on the World Heritage list. Each side is lined with dramatic cliffs and dotted with caves and monasteries used by various persecuted religious minorities over the centuries. Villages made of stone, with red-tiled roofs seemed to appear around every other corner. We made our way to the highest village in the Middle East, at 1,750 meters/5,740 feet. It is B’Qaa Kafra, and is the birthplace of St. Charbel, who some believe causes miracles to occur. It is a picturesque village all made of stone, with very friendly people, and the biggest cabbages I have ever seen (for sale, in small stores). A gift shop outside a church there sold rosaries (surely the ones made of blue evil-eye stones offer the best protection? ), incense, plaques and other items with Bible verses in Arabic, English and French-- mostly Arabic, some painted on slabs of cedar which one does hope came from fallen branches. On to the Cedars, and a lovely walk through the trees. WE HAD TO BRING AND ACTUALLY WEAR SWEATERS, and that was noteworthy and wonderful. Yes, it’s October but down in Beirut we are still sweating. Up there it was cool and the air was clean and delicious. Also, it was Q U I E T. Ahhhh. [Our apartment really isn’t that bad but city life does involve a fair bit of background noise, e.g. the squeaky brakes of the newspaper delivery guy at 6 am]. Outside the presrve, shops selling baby cedar trees and more cedar plaques, some with Bible verses, more with Koran verses. Then, a classic Lebanese meal with a dozen or more dishes—“mezze.” It does tend to be the same dozen dishes every place, but they are always wonderful, and in a group each person can pig out on the thing they like best. The typical dishes seem to be: hummous (garbanzos with sesame butter, garlic and olive oil); babaghanouj (roasted eggplant with ditto); tabouli (parsley, mint, tomato, lemon juice and a little bulgur wheat—much less bulgur than we make it with in the States—you hardly know its there for all the greenery); french fries, sometimes with a heavenly garlic sauce; stuffed grape leaves; green salad; lamb kofta (ground lamb meatballs with bulgur? Don’t ask me, I’m a vegetarian); grilled chicken and beef; olives; various pickles; pita bread; fresh fruit. Large, decorated glass water pipes sat on the shelf ready for customers to order charcoal and flavored tobacco. This mountain top restaurant, near the ski slopes, looked like a very cozy place to go après ski, when the wood stove would be fired up. The main wall was stone, there was a red tiled roof, and there were plenty of windows looking out over the trees. OK, Laura—here are the ski facts for the Cedars: altitude is 1,950 – 3,078 meters/5,740 - 10,000 feet. There are 8 lifts, 3 for experienced skiers. The runs are long. The season starts in mid-December and goes until April. Lonely Planet says, “There are numerous “off-piste” opportunities for the more adventurous types”. A lift ticket is only $30—so what are you waiting for? Or perhaps you’d prefer of the other ski areas: at Faqra you can visit Greek ruins when you’re done on the slopes—they apparently look terrific under a layer of snow; Laklouk is peaceful, with good cross-country; and Zaarour, at 2,000 meters/6,560 feet, has 2 advanced lifts, uncrowded slopes and awesome views. Lebanon, land of the ancient Phoenicians, is in the Middle East, on the Mediterranean Sea. It’s bordered by the Mediterranean Sea to the west, Palestine/Israel to the south, and Syria to the east and north. Cyprus is only 125 miles away, across the Mediterranean to the northeast. Italy’s a $300 roundtrip plain ride away (yes!). It is the only Middle Eastern country with no desert. It is long and narrow, with a long strip of sea coast (where Beirut is), and two mountain ranges reaching 10,000 feet, with the rich Bekaa Valley inbetween. Roads in most of the country snake around ridges along hillsides, and some communities are still difficult to reach. The largest religious groups are Shiite Muslims, Christians, and Sunni Muslims, followed by Druze (an offshoot of Islam influenced by Greek philosophy). Maronite Christians (basically, Roman Catholics of Eastern origin) are the largest Christian group, followed by Melkite (Syrian) Catholics and Armenian Othodox. There are also Armenian, Roman and Chaldean Catholics , Greek Orthodox, and Protestants, some Bahai and at least 12 Quakers! It’s small—4,000 square miles (that’s 10,000 square kilometers)—the size of Connecticut, or for you Washingtonians, Peirce, King and Thurston counties combined. Small. Four million Lebanese live here; it is said that 16 million live elsewhere, in Europe, the U.S., Canada, Brazil, Egypt, Kuwait. One famous Lebanese person who left was Khalil Gibran. He was from Tripoli, in the north. It’s hot in Summer—still now, in early October—but gets cold in winter, which I hear is November – March. The latitude is 34°, like Los Angeles. Hey, Washingtonians: This place has 300 days of sun a year. Lebanon is stuffed with ancient ruins: Phoenician, Roman, Crusader, and Ottoman Empire. They are all around the country and we have much to explore… In downtown Beirut alone there are preserved remains of a Roman bath and market, a Maronite church dating back to the Crusades, and an Ottoman era building that now houses Parliament.